T. Jefferson Parker discusses "The Border Lords" and "Iron River"
The author of seventeen novels, Parker lives in Southern California. 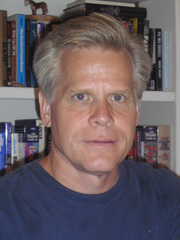 Scott Montgomery is a fiction writer and crime novel taste-maker, and bookseller in Austin, Texas. C.S. Graham discusses "The Babylonian Codex"
C.S. Graham is the pseudonym of writing team Steven Harris and Candice Proctor. Grant Jerkins is a writer and bookseller in Georgia. Yunte Huang discusses "Charlie Chan"
Yunte Huang is a professor of literature at UC at Santa Barbara. Douglas Perry discusses "The Girls of Murder City"
Douglas Perry is journalist and editor who lives in Portland, Oregon. Jerry Stahl discusses "Pain Killers"
Jerry Stahl is a novelist, essayist, and screenwriter living in Los Angeles. Deborah Schupack discusses "Sylvan Street"
Deborah Schupack is a novelist living New York. Tim Dorsey discusses "Gator A-Go-Go"
Tim Dorsey lives in Florida and is busy writing his 13th Serge A. Storms novel. Deborah Crombie discusses "As Necessary as Blood"
A native of North Texas, Deborah Crombie is busy writing her fourteenth Kincaid/James novel. Lou Berney discusses his novel "Gutshot Straight"
Jonny Porkpie discusses "The Corpse Wore Pasties"
Charles Ardai is a writer, publisher, and entrepreneur. Victor Gischler talks about Go-Go Girls of the Apocalypse. Victor Gischler is a writer living in Baton Rouge. Todd Goldberg discusses his novel "Living Dead Girl"
Norman Green discusses his novel "Way Past Legal"
Bill Fitzhugh discusses his novel "Highway 61 Revisited"
Bill Fitzhugh writes satiric crime novels, the occasional comic mystery, and a weekly show for the Deep Tracks channel of XM Satellite Radio. Author James Siegel discusses his novel "Derailed"
James Siegel is a thriller novelist and Vice Chairman of the Board of Directors of BBDO New York.